Creative Edge Focusing (TM). 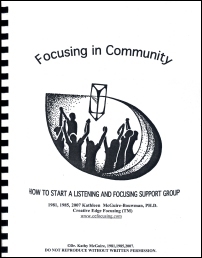 Complete instructions for starting a Focusing Partnership and a Focusing/Listening Practice Group (a Changes group) with Chapters on Finding Your Core Group, Focusing, Lstening/Focusing Exchange, Interpersonal Focusing, Collaborative Decision Making. Dr. McGuire has 30 years experience teaching Listening/Focusing Partnership skills and leading Changes groups. 1981, revised 2007.